Our PBW316 series Knifekits.com phosphorous-bronze pivot washers were designed to our specifications, ultimately to replace the standard Teflon washers in our large kit models and for builders who want the best in performance. These are designed to fit any 3/16" pivot pin in any folding knife or balisong on the market. These washers help the blade to become more ridged in the handle, reducing side-to-side play, while producing the smoothest action and slippage available. 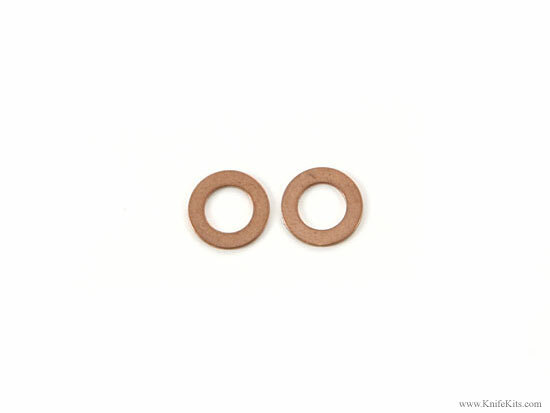 Our 3/16" phosphorous-bronze pivot pin washers are designed to work in any folding knife or balisong. Professionals prefer the phosphorous-bronze composite washer material for its ultra-high slip properties, while providing excellent tensile strength, a noted characteristic of all high performance folding knives.